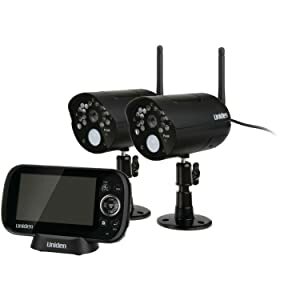 Uniden UDR444 Guardian 4.3-Inch Video Surveillance System with 2 Cameras (UDR444) is an advanced security surveillance device that comprises of 2 cameras with wireless connectivity system. The unique features of the device allow to discreetly monitoring your office or home under any odd climate conditions. Each of the cameras are having 40 feet night vision shooting capacity and also supported with built-in microphones to capture any sounds are some of the unequivocal technical features when compared with any contemporary security camera system presently available in the market. Optional features like live coverage remotely by using Skype or watching 12 hours continuous recorded footages, options to switch between manual and automatic recording and scheduling the timing of recording as per your convenience make this security camera one of the most advanced surveillance system. Uniden UDR444 includes 2 weatherproof cameras that are used to keep an eye of one’s residence or office at any given time irrespective of the weather condition. This product is accompanied by 1 Lithium Metal battery and a high resolution 4.3 inches color monitor that uses LCD display. These cameras come with built in microphones. In addition, a 4GB micro SD card is provided to store the footages, along with the USB cable that enables data transfer or remote viewing by using PC. The user manual provided in the kit serves as a guide to the users, allowing easy and flawless installation of the surveillance kit. Few other accessories delivered as part of this kit are 2 camera antennas, Audio and video cable, 3 AC adapters, Monitor cradle and 2 camera stands. One of the key features of this surveillance system is the rechargeable Lithium Polymer battery that comes with auto power save facility. Due to this, the device can operate for about 4.5 hours without any interruption. With this security surveillance device, user can record the footages in multiple ways, i.e. the user can either record the footages manually, or schedule the system to record at required time interval or even choose to record the videos based on motion detection. This product uses Passive Infrared Sensor (PIR) technology for motion detection. The videos when viewed using the 4.3 Inch color monitor, resolution 480 x 272, looks clear and crisp. You can connect these cameras to a TV to view your videos. However, the picture resolution will decrease based on the monitor size, i.e. larger the monitor, grainier the pictures. Also, the user can zoom in the images/videos for a more detailed view. The power cord provided is up to 72 inches long. If the 4GB Micro SD is not sufficient, the user can replace it with another Micro SD Card having storage capacity up to 32 GB etc are some of the highlighted specification of Uniden UDR444. This surveillance system comes at a very affordable price, which is one of its prime advantages. The built in microphones in Uniden UDR444 enable the user to capture both audio and video. Based on the user’s needs; he/she can prefer to increase the security by adding 2 more cameras to the existent pair of cameras. The buyer has the option to record the videos in either low quality (320×240) or high quality (640×480). It prevents the SD card’s memory from getting filled. However, the user can alternately opt to overwrite older videos and thus using the memory card for continuous recording. This wireless surveillance system is easy to setup. This device also offers wireless transmission for up to 500 feet, which can be viewed using the color monitor provided. The 2 weatherproof cameras are capable of capturing videos for about 40 feet of distance. The user can also view the footages remotely either using Skype application or by connecting the device using USB port of a Personal Computer. You need 2 Skype accounts to use remote viewing. The 2 weatherproof surveillance cameras are already paired up with the 4.3 Inch color monitor and, therefore, the user need not spend any time in pairing up these devices. Uniden UDR444 allows users to monitor all 4 cameras on one screen or one camera at a time. The micro SD card provided could have been of higher capacity as 4GB can hardly store 16 hours of data. Also, it is observed that, when the weather is too windy, due to motion sensors, the SD card gets full even sooner. Finally, this device is not compatible with Mac Operating system. Wireless surveillance systems are gaining popularity due to the portability it offers. Having the easiest installation process; Uniden UDR444 is one of the most recommended surveillance camera systems currently available in the market. The pre configured system is also ready to use the moment it is fixed in its position for surveillance. The automatic setting features will take care of the remaining process. Stuffed with high-end configurations; this security camera, by all means is one of the best choices and offers great value for money. Your surveillance requirements are certainly justified with its stellar performance. Uniden UDR444 is an ideal solution for those who want to guard their residence or office without wires, especially at an optimum price!